Israeli soldiers abducted, on Wednesday at dawn, two Palestinian children and a young man from Batn al-Hawa neighborhood in Silwan town, south of the Al-Aqsa Mosque, in occupied East Jerusalem. The Wadi Hilweh Information Center in Silwan (Silwanic) has reported that dozens of soldiers invaded the town, and were extensively deployed in Batn al-Hawa, especially on the main road, and around many homes. 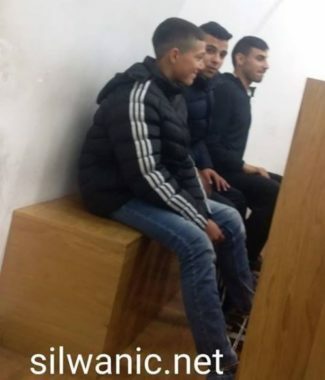 Silwanic added that the soldiers invaded and searched several homes before abducting Ahmad Eyad Rajabi, 13, Hamza Zoheir Rajabi, 16, and Yousef Maher Rajabi, 20. It is worth mentioning the dozens of soldiers invaded, late on Tuesday at night, many areas in the town, especially Be’er Ayyoub and Ein al-Louza, before stopping and searching many cars and young men, and fired concussion grenades and rubber-coated steel bullets. Several youngsters hurled stones at the invading military jeeps, in addition to using fireworks.